On Tuesday, the Subcommittee on “Migration and Border Issues” of the Technical Secretariat of the Haitian-Dominican Mixed Commission (CMB) held a working session at its premises located at Frères 18. 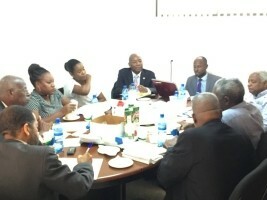 The meeting was attended by representatives of various member institutions of this subcommittee including : the Dominican Affairs Department of the Ministry of Foreign Affairs (DAD), the ZILE Foundation, the Ministry of Haitians Living Abroad (MAHVE) and the Technical Committee of Frontiers (CTF). The discussions focused on the planning of the agenda of the activities of the Subcommittee for the new fiscal year. Some news files were also discussed including, among others : the migration issue and the renegotiation of the 1999 agreement on repatriation mechanisms with the Dominican Republic.